I made this cross in late May of 2008, on a whim. I wanted to determine what, if any, fertility the Spinosissima hybrid 'William III' might have. It is a remarkably sturdy, disease free rose with great charm in a garden setting, and exquisitely scented purplish-pink blooms. I figured it might have some merit in breeding for improved care-free shrubs. 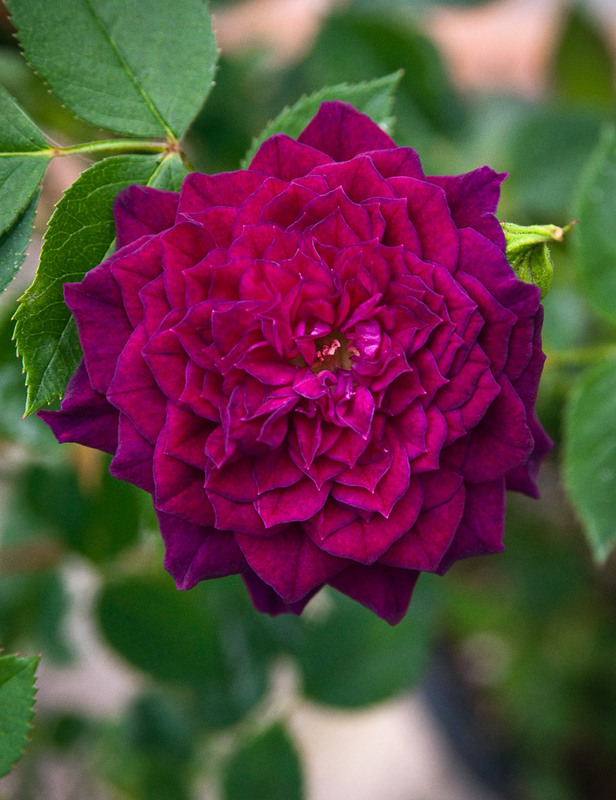 I chose 'Condoleezza' simply because it is my "indicator" rose for breeding. If 'Condoleezza' won't take a specific pollen, nothing will. What I got was about 7 well developed hips full of seed, and nearly every one of 'em germinated. 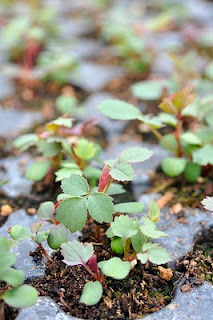 The result was about 70 seedlings, of which I selected about 30 to grow on. (I made selections based solely on vigor, health and attractive growth habits/foliage, as none of these would bloom will the next year) Well, these are now leafed out and the first three are showing buds. Much to my surprise, all three are Mosses! 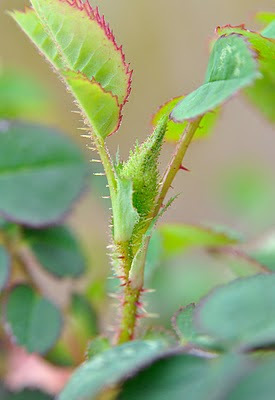 ('Condoleezza' is very hit-or-miss when it comes to transmitting the mossing trait) Shown here is the most well developed of the three, clearly illustrating well mossed buds. Suddenly these seedlings are far more interesting to me as far as taking them forward into another generation is concerned. I will post more images as these grow. More info about 'Condoleezza' here. "Pteragonis" is very similar to R. sericea pteracantha, with the same ornate red thorns, but a larger flower in a pale butter yellow hue. 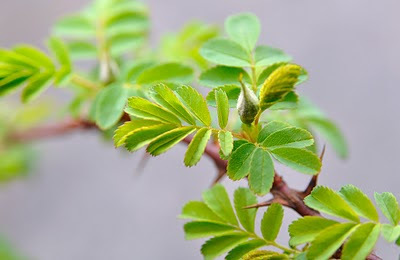 It makes a very interesting specimen shrub with virtues that go far beyond that of an ordinary Spring blooming species hybrid. For more info on "Pteragonis" see the HelpMeFind listing here. Today I potted up the seedlings from cross 100-09 ('Golden Angel' X 'Champlain'). I have over 100 individuals of this cross now, which is ideal. Ralph Moore told me that he believed that you weren't seeing the full scope of what was possible in a cross until you had at least 100 seedlings to look at. Also noteworthy is that the seed parent, 'Golden Angel' is a known triploid, and yet I got nearly 98% germination from this cross. The popular mythology about triploids suggests that they are often infertile or have very limited fertility. Clearly that is not always true. I suspect if we did gene counts of many highly fertile parents, we'd discover many triploids. Where to buy roses, by Carolyn Parker. Thanks Carolyn! 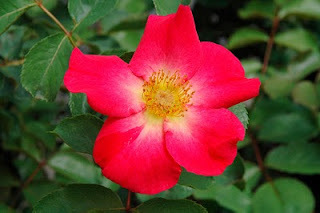 Following quickly on the heels of my last post about R. fedtschenkoana, here is another rose that has a species prominently featured in its pedigree. 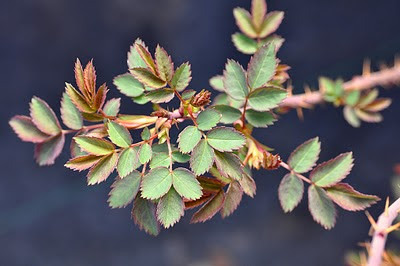 The species in this case is the native North American R. nutkana, a beautiful thicket forming shrub with excellent architecture and often very richly colored single blooms. Here, Ralph Moore put pollen from 'Schoener's Nutkana' (R. nutkana X 'Paul Neyron') onto 'Orangeade' (if 'Orangeade' won't take your pollen, nothing will!) 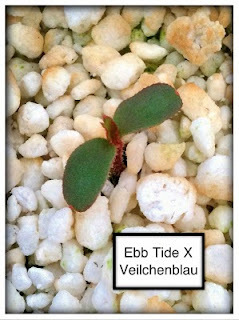 and this was the seedling Ralph saved from the cross. 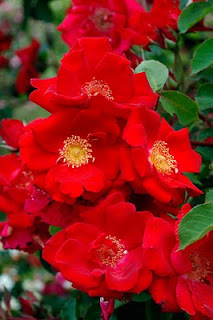 (There may have been others, but this is the one I know about) It is a large plant to 12 feet or more, with graceful arching architecture, presenting clusters of 3 to 7 blooms all along its canes at every lateral. In many ways, it comes close to the ideal plant architecture for a rose, in my mind, and it is this trait that I include this rose in my work. I made several crosses with this hybrid about 7 years ago and found it to be a less than willing seed parent. Now that it is fully established I find it sets seed much more readily, and so in 2009 I made a number of crosses and await the germination of the seeds. Although "Moore's Nutkana" leaves something to be desired in terms of Blackspot resistance and freedom of bloom (it blooms only sparingly after the first flush), these problems can be fixed in subsequent generations. *crosses fingers* I'll post photos of anything worth looking at when the seedlings are up and (hopefully) blooming. 54-08-03 = 'Midnight Blue' X ('Orangeade' X R. fedtschenkoana). The latter is a Kim Rupert hybrid given to me years ago for breeding purposes. See: LINK. Some of you probably know that R. fedtschenkoana was identified about a decade ago as one of the species that helped found the Damask class. Since then, some hybridizers like Kim Rupert have incorporated the species into their breeding program in order to explore its genes as a potential source of new characteristics. Kim gave me a piece of his 'Orangeade' X R. fedtschenkoana hybrids several years ago and I have only recently started using it in my work. It took several years to start to flower, and because it clearly isn't ideally suited to my climate, it blooms only sparingly during its first cycle. And so, I rarely have pollen available at the right time. However, in 2007 I managed to pollinate a few late blooms of 'Midnight Blue' with its pollen and about 14 seedlings resulted. Several of these grew so fast that they had to be moved into 5 gallon cans by June! I can see that hybrid vigor is something Kim's hybrid can bring into the mix. As expected, none of these flowered in their first year, and although "Kim's Fedtschenkoana" does rebloom, I don't expect my seedlings to be remontant. Often the remontancy genes from one class don't "play nice" with remontancy genes from another and what you get are mostly once bloomers. We shall see. To be honest, I don't expect anything but pinks, but with 'Orangeade' and 'Midnight Blue' in the mix, anything is possible. The more I work with breeding roses, the more I find myself exploring non-traditional territory, often involving species and near-species hybrids. 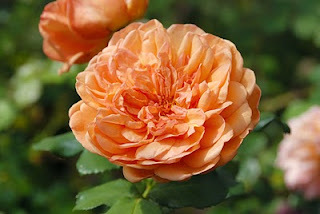 I think that if anything truly original and new is to be done with roses, it will surely come from the experimental breeding work of the dedicated "amateurs". (My friends, you know who you are!) The temptation to make crosses that will yield quick results is always there, but I say RESIST that temptation, and dare to strike your own trail. You just might end up creating a building block that future hybridizers might find invaluable in leading their own work forward. What better legacy could you want? !